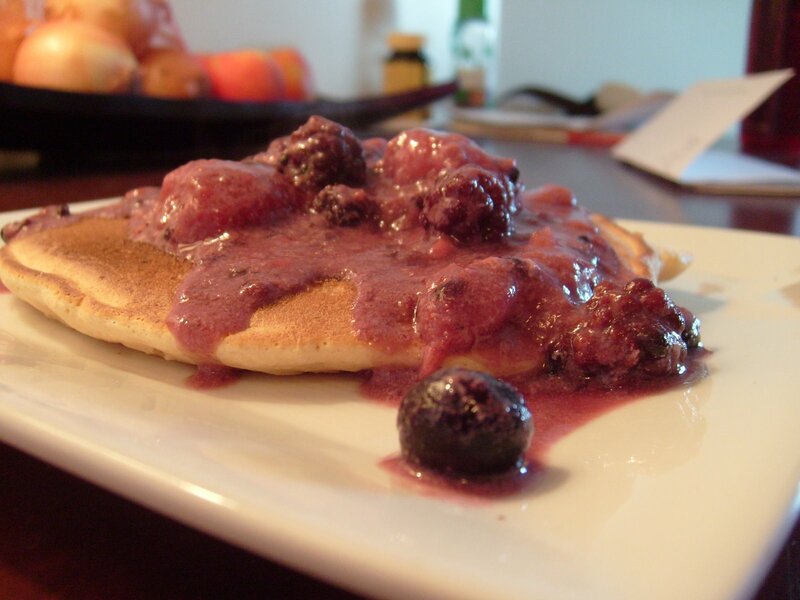 Pankcakes with Fruit Topping – Nutrition.Health.Life. Mix the dry ingredients together in a medium bowl. In a small bowl, whisk the milk, oil, an egg. Add the wet ingredients to the dry ingredients and stir with a whisk just until blending. If you over mix the ingredients they will not give you a fluffy pancake. Pour 1/4 cup of batter onto a preheated griddle or skillet. I find the griddle works much better for pancakes because you can make more at once and they don’t get crowded. Cook until lightly browned on each side. Whisk the egg yolk, milk, and 1 tbsp of sugar together in a small sauce pan. Place over medium heat and continually whisk to prevent curdling. Cook for 3 minutes. Add Fruit and continue to mix until the desired consistency is formed. Add more sugar to taste, if needed. This entry was posted in Nutrition and tagged breakfast/brunch, fruit, pancakes. Bookmark the permalink.